Serve this hearty autumn dish with custard, cream or ice cream for a delicious pudding all the family will love. 2. In a large bowl, sift the flour and baking powder together, then rub in the butter until it resembles breadcrumbs. Stir in the remaining light brown sugar. 3. Beat together the egg and buttermilk then stir into the flour mixture to make a batter. Drop spoonfuls of the batter on top of the blueberries then scatter over the chopped hazelnuts and demerara sugar. Bake for 35–40 minutes until golden brown. 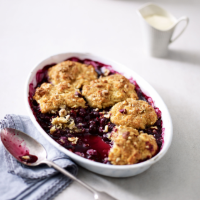 Cook's tipThere’s a good range of frozen fruit in store that would be suitable for this recipe, including essential Waitrose Black Forest Fruit and essential Waitrose Raspberries.